Ke-Shawn Hayes is one of the quietest guys in the room. 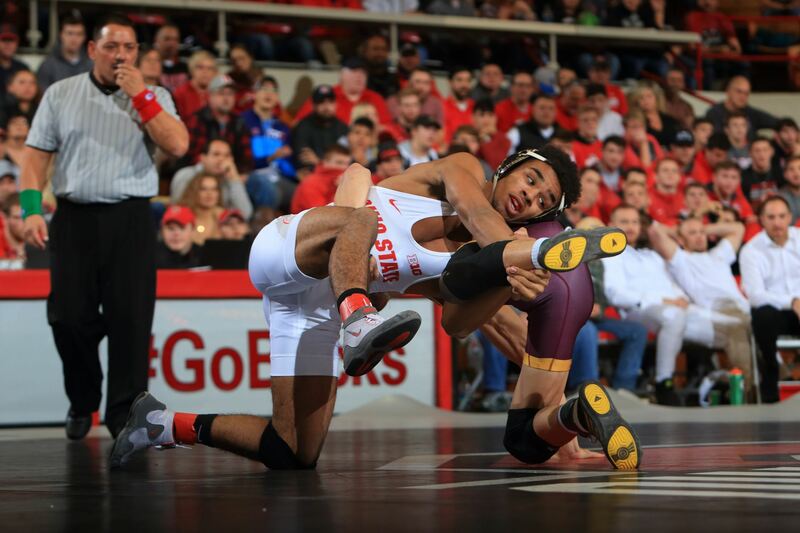 The redshirt junior is not normally the one first thought of when looking at the Ohio State wrestling team, with senior captain Myles Martin, redshirt junior Kollin Moore and redshirt senior Micah Jordan on the roster. Hayes knows he often goes unnoticed. It’s something he has embraced. After ending his redshirt freshman season in November after suffering a knee injury in 2016, Hayes bounced back in a huge way last season, recording an overall mark of 29-7 with eight technical falls, seven major decisions and a pin. He placed third in the Big Ten Championships that season, earning the No. 5 seed in the NCAA Championships. According to Hayes, the knee injury hasn’t affected his ability to compete or earn accolades. This season, he said he is feeling better than ever before. Hayes said the competition on Ohio State’s roster is a grind to face in practice, but will help him in the long run. Having success on the wrestling mat has never been a problem for the redshirt junior. Dating back to his high school days, Hayes was the No. 4 overall recruit by InterMat and finished with a 38-0 record as a senior, leading Park Hill to its third-straight Missouri state championship. He won all but seven of his matches by pin or technical fall and was named the Kansas City All-Metro Wrestler of the Year. Ohio State head coach Tom Ryan said Hayes’ track record in high school made him a valuable recruit and into what he is for the Buckeyes now. Hayes has racked up a nice list of accolades on the mats to be proud of, but out of all his accomplishments, Hayes said it’s his academic career at Ohio State that he is most proud of.